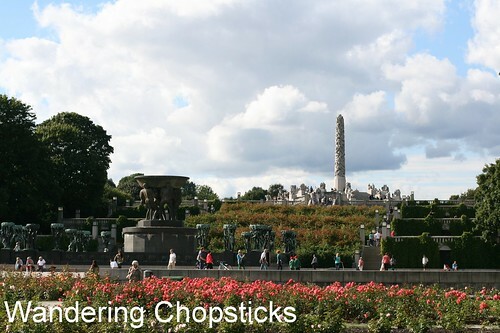 Wandering Chopsticks: Vietnamese Food, Recipes, and More: Guess Where I'm Wandering 5? So you figured out I'm in Oslo, Norway. This is one of my favorite spots that my cousin took me to on my first visit 15 years ago. This park features several hundred statues by one artist, who donated all his sculptures to the city. The sculptures run the gamut of human emotions and ages. I'll show you some of my favorites in more depth later. 1 year ago today, Ding's Garden - Alhambra (Closed). 2 years ago today, House Foods Chinese Mabo Tofu Sauce. 3 years ago today, my sad little tomato harvest. 4 year ago today, a garden tour and outdoor party. 5 years ago today, whipped cream, clotted cream, Butter with a handheld mixer. I bet our cousins do know each other! The community is so small.